Günümüzde havacılık sektörü, bilgi teknolojilerinin yoğun olarak kullanıldığı ve küresel gelişmelerin güncel olarak takip edildiği kritik alanlardan birisidir. Yapılan bu çalışmada örgütsel adalet algısı ile teknolojik anlamda iş verimi arasındaki etkileşimi belirlemek amacıyla sosyal değişim kuramı, katılım kuramı, örgütsel güçlendirme kuramı, beklenti kuramı ve bilgi asimetrisi kuramları irdelenmiştir. Bu kapsamda Türkiye’de genel havacılık kurallarına göre faaliyet gösteren havacılık işletmelerinde çalışan pilotlardan elektronik posta yoluyla veriler (n=188) toplanmıştır. Yapılan analizler (keşfedici ve doğrulayıcı faktör analizi, korelasyon ve çoklu regresyon analizi) neticesinde, örgütsel adalet algısının alt boyutlarından dağıtımsal, işlemsel ve kişiler arası ilişkisel adalet algılarının işgörenin teknolojik verimliliğini anlamlı düzeyde yükselttiği tespit edilmiştir. Bilgisel adalet algısının ise teknolojik verimlilik üzerindeki etkisinin pozitif yönlü fakat istatistiksel olarak anlamlı düzeyde olmadığı görülmüştür. Elde edilen sonuçlar literatürde ilişkili olduğu değerlendirilen çalışmalar kapsamında tartışılmıştır. Today aviation industry is considered as a critical sector in which information technologies are highly employed and global technological improvements are accurately followed. In this research, the association between perceived organizational justice and information technological productivity concepts is scrutinized using the theories namely social exchange, participation, organizational empowerment, expectation and information asymmetry. In this concept, data (n=188) is collected from general aviaton pilots operating in Turkey using e-mails. The results of the analyses (exproratory and confirmatory factor analyses, correlations, multiple linear regressions) show that perceived organizational justice siginificanly increases information technological productivity. In detail, while its all four sub-dimensions namely perceived distributive, transactional, procedural and commutative justices increase information technological productivity, only perceived commutative justice dimension’s impact is not statistically significant. Findings are discussed with the related studies in the literature. ge. Advances in Experimental Social Psychology, 2, 267-299.Aero-news (2007Adams, J. S. (1965). Inequity in social exchan). Northwest Airlines Flight Cancellations Mount As Labor Woes Continue, http://www.aero-news.net/index.cfm?do=main.textpost&id=b8208fa4-794b-4988-9ab7-50cac2825767 (Erişim: 30.11.2015).Akerlof, G. A. (1970). The market for “lemons”: Quality Uncertainty and the market mechanism, The Quarterly Journal of Economics, 89, 488-500.Alam, M. A. (2016). Techno-Stress and Productivity: Survey Evidence from The Aviation Industry. Journal of Air Transport Management, 50, 62-70.Anderson, J. ve Gerbing, D. (1988). Structural Equation Modeling in Practice: A Review and Recommended Two-Step Approach. Psychology Bulletin, 103 (3), 411-423.Bağdemir, A. (2009). “Adalet mülkün temelidir” özdeyişi üzerine. Turkish Studies, 4(3), 283-296.Baker, E. W., Al-Gahtani, S., & Hubona, G. S. (2011). Cultural impacts on acceptance and adoption of information technology in a developing country. International Comparisons of Information Communication Technologies: Advancing Applications: Advancing Applications, 54.Bal, V. (2014). Örgütsel Adalet ve Örgütsel Bağlılık İlişkisi: Manisa’daki Eğitim Kurumlarında Bir Araştırma, Aksaray Üniversitesi İktisadi ve İdari Bilimler Fakültesi Dergisi, 6(1), 1-9.Banks, J.A. (1963). Industrial Participation: Theory and Practice: A Case Study, Liverpool: University Press.Beam, R. A., Kim, E., & Voakes, P. S. (2003). Technology-induced stressors, job satisfaction and workplace exhaustion among journalism and mass communication faculty. Journalism & Mass Communication Educator, 57(4), 335.Berger, M. L., Murray, J. F., Xu, J. ve Pauly, M. (2001). Alternative valuations of work loss and productivity. Journal of Occupational and Environmental Medicine, 43(1), 18-24.Bies, R. J., ve Shapiro D. L. (1988). Voice and justification: Their influence on procedural fairness judgments. Academy of Management Journal, 31(3), 676-685.Blau, P. (1964). Exchange and Power in Social Life, New York: Wiley.Cerit, Y. Ç. (2012) Teknoloji, havacılıkta rekabetçi avantajın başlıca kaynağı, http://www.bthaber.com/bilisim-dunyasi/teknoloji-havacilikta-rekabetci-avantajin-baslica-kaynagi/1/5076, (Erişim: 25.11.2016). Cihangiroğlu, N. (2009). Örgütsel bağlılığın belirleyicileri olarak örgütsel adalet ve kararlara katılım. Atatürk Üniversitesi Sosyal Bilimler Enstitüsü Yayımlanmamış Doktora Tezi.Cihangiroğlu, N., Şahin, B. ve Naktiyok, A. (2012). Hekimlerin Örgütsel Adalet Algıları Üzerine Bir Araştırma. Uluslararası Yönetim İktisat ve İşletme Dergisi, 6(12), 67-82.Cohen-Charash, Y. ve Spector, P. E. (2001). The role of Justice in Organizations: A Meta-Analysis. Organizational Behavior and Human Decision Processes, 86(2), 278-321.Colquitt, J. A., Conlon, D. E., Wesson, M. J., Porter, C. O. ve Ng, K. Y. (2001). Justice at the millennium: a meta-analytic review of 25 years of organizational justice research. Journal of applied psychology, 86(3), 425.Danziger J. N. (1985). Social science and the social impacts of computer technology. Social Sci, 66(1), 3-21.Davis, F. D., Bagozzi, R. P., & Warshaw, P. R. (1992). Extrinsic and Intrinsic Motivation to Use Computers in the Workplace. Journal of Applied Social Psychology (22), pp. 1111-1132. Farh, J. L., Podsakoff, P. M. ve Organ, D. W. (1990). Accounting for organizational citizenship behavior: Leader fairness and task scope versus satisfaction. Journal of management, 16(4), 705-721.George, J. M., & Jones, G. R. (2012). Understanding and managing organizational behavior. Reading, MA: Addison-Wesley.Greenberg, J. (1990). Organizational Justice: Yesterday, Today and Tomorrow. Journal of Management, 16(2), 399-432.Greenberg, J. ve Cropanzano, R. (1993). The social side of fairness: Interpersonal and informational classes of organizational justice. Justice in the workplace: Approaching fairness in human resource management, NJ. : Lawrence Erlbaum Associates.Greg, B.R., Chen, Y.N., Grover, V., and Stewart, K.A. (1992). An Application of Expectancy Theory for Assessing User Motivation to Utilize an Expert System. Journal of Management Information Systems (9), pp. 183-199.Gürbüz, Y. G. (2001) Havacılık Alanındaki Teknolojik Gelişimin Diğer Alanlara Ve Güncel Hayata Etkisi, TMMOB Makina Mühendisleri Odası I. Ulusal Uçak Havacılık ve Uzay Mühendisliği Kurultayı, 12 Mayıs 2001 Eskişehir-Türkiye.Hu, L. ve Bentler, M. (1995). Evaluating model fit, içinde: R. H. Hoyle (Ed. ), Structural equation modeling: Concepts, issues, and applications, Sage, Thousand Oaks, CA, s. 76-99.Joanes, D. N. ve Gill, C. A. (1998). Comparing measures of sample skewness and kurtosis. Journal of the Royal Statistical Society (Series D): The Statistician, 47 (1), 183-189.Joo, Y. J., Lim, K. Y., & Kim, N. H. (2016). The effects of secondary teachers’ technostress on the intention to use technology in South Korea. Computers & Education, 95, 114-122.Kanter, R. M. (1993). Men and women of the corporation (2nd ed.). New York: Basic Books.Koopman, C., Pelletier, K. R., Murray, J. F., Sharda, C. E., Berger, M. L., Turpin, R. S., ... ve Bendel, T. (2002). Stanford presenteeism scale: health status and employee productivity. Journal of Occupational and Environmental Medicine, 44(1), 14-20.Laguador, J. M. (2013). Technology as a Source of Stress Among Employees: Input to Human Resource Management (A Review). International Journal of Information, Business and Management, 5(3), 77.Laumer, S., & Eckhardt, A. (2010). Why do People Reject Technologies?-Towards an Understanding of Resistance to IT-induced Organizational Change. In ICIS (p. 151).Leung, K., Tong, K. K. ve Ho, S. Y. (2004). Effects of interactional justice on egocentric bias in resource allocation decisions. Journal of Applied Psychology, 89(3), 405-415.Luthans, F. (1994). Organizational Behavior. New York: McGraw Hill.Marsh, H. W. ve Hocevar, D. (1985). Application of confirmatory factor analysis to the study of self-concept: First- and higher-order factor models and their invariance across groups. Psychological Bulletin, 97, 562–582.Martinussen, M. ve Hunter, D. R. (2010). Aviation Psychology and Human Factor. USA: Taylor & Francis Group.McCunney, R. J. (2001). Health and productivity: a role for occupational health professionals. Journal of occupational and environmental medicine, 43(1), 30-35.Miller, K.I ve Monge, P. R. (1986). 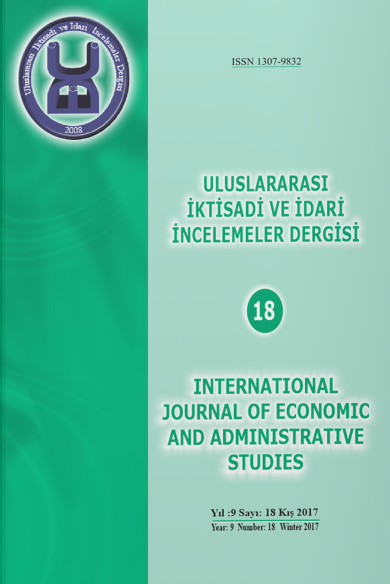 Participation, Satisfaction and Productivity: A Meta- Analytical Review, Academy of Management Journal, 29(4), 727-753.Özmen, T. Ö., Arbak, Y. ve Özer, P.S. (2006). Degerler ve Adalet, Marmara Üniversitesi 14. Ulusal Yönetim ve Organizasyon Kongresi, İstanbul, 161-162.Rappaport, J. (1984). Studies in empowerment: Introduction to the issue. Prevention in Human Services, 3, 1–7.Robbins, S. P. (2001).Organizational Behavior. New Jersey: Prentice-Hall.Robbins, S. P. ve Judge, T. A. (2013). Örgütsel Davranış. Çev. İnci Erdem, Ankara: Nobel.Rossignoli, C., Mauro, G. ve Rocco, A. (2016). Introducing and Discussing Information and Technology Management for Organizational Innovation and Change. In Organizational Innovation and Change (pp. 1-7). Springer International Publishing.Sabuncuoğlu, Z. ve Tokol, T. (1992). İşletme- I, Bursa: Rota Ofset.Schermelleh, E. K., Moosbrugger, H. ve Müller H. (2003). Evaluating the Fit of Structural Equation Models: Tests of Significance and Descriptive Goodness-of-Fit Measures. Methods of Psychological Research Online, 8(2), 23-74.Servati, S., ve Najafzadeh, M. R. (2015). The Relationship between Organizational Justice and Productivity of Managers in Sports Clubs in East Azarbaijan. International Journal of Basic Sciences and Applied Research, 4(4), 251-254. Sivil Havacılık Genel Müdürlüğü, SHY-6B (2013). 14 Mayıs 2013 tarih ve 28647 sayılı Sivil Havacılık Genel Müdürlüğünün SHY-6B numaralı Genel Havacılık Yönetmeliği.Steiger, J.. H. (1990). Structural model evaluation and modification: An interval estimation approach. Multivariate Behavioural Research, 25, 173-180.Stott, J. R. R. (2013). Orientation and disorientation in aviation. Extreme Physiology & Medicine, 2(1), 1.Tabachnick, B. G. ve Fidell, L. S. (2007). Using Multivariate Statistics, 5th Edition Boston: Perason Education, Tarafdar, M., Qiang, Tu, Bhanu, S.ve Ragu-Nathan, T.S. (2007). The Impact of Technostress on Role Stress and Productivity, Journal of Management Information Systems, 24(1), 307-334.Tatlıdil, H. (1996). Uygulamalı Çok Değişkenli İstatistiksel Analiz, Ankara: Cem Web Ofset Ltd.Şti.Thomas, K. W. ve Velthouse, B. A. (1990). Cognitive Elements of Empowerment: An 'Interpretive' Model of Intrinsic Task Motivation. Academy of Management Review, 15(4), 666-681.Torkzadeh, G. ve Doll, W.J. (1999). The development of a tool for measuring the perceived impact of information technology on work. J. Manag. Sci., 27 (3), 327-339.Tseng, K. H., Chen, K. H., & Chu, C. L. (2016). Design and implementation of flight information management system. In Industrial Electronics and Applications (ICIEA), 2016 IEEE 11th Conference on (pp. 61-65). IEEE.Ullman, J. B. (2001). Structural equation modeling, Içinde: B. G. Tabachnick ve L. S. Fidel (Ed. ),Using Multivariate Statistics, (4th ed; s.:653- 771), Allyn&Bacon, Needham Heights, MA.Venkatesh, V. (2000). Determinants of perceived ease of use: Integrating control, intrinsic motivation, and emotion into the technology acceptance model. Information systems research, 11(4), 342-365.Vroom, V. H. (1964). Work and motivation. New York: WileyXue, Y., Liang, H., & Wu, L. (2011). Punishment, justice, and compliance in mandatory IT settings. Information Systems Research, 22(2), 400-414.Ybema, J. F., Meer, L. ve Leijten, F. R. (2016). Longitudinal Relationships Between Organizational Justice, Productivity Loss, and Sickness Absence Among Older Employees. International journal of behavioral medicine, 1-10. Yeloğlu, H. O. ve Paşamehmetoğlu, A. (2014). Örgütsel Davranış. Ed. Ünsal Sığrı ve Sait Gürbüz. İçinde Motivasyon s.137-174, İstanbul: Beta.Zuboff, S. (1988). In the age of the smart machine: the future of work and power. New York: Basic Books.